Central Reception and Assignment Facility is located in Trenton New Jersey, part of Mercer County. It is a centralized processing facility that is responsible for the intake, evaluation, diagnosis and assignment of all Male offenders in the state. During intake, inmates are given psychological, educational, and physical examinations including medical and dental exams. 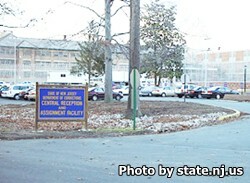 Central Reception and Assignment facility holds a population around 950 inmates. The facility is also responsible for a satellite work camp called the Jones Farm. Jones Farm is a minimum security facility that houses nonviolent offenders for short periods. Select offenders at Jones Farm can be assigned to work in supportive roles for the institution doing janitorial, maintenance work, laundry and landscaping. Visiting for CADRE Unit and Jones Farm Unit is on Saturdays and Sundays in two sessions, from 8:30am-10:30am and from 12:30pm-2:30pm. Registration for the visiting sessions are from 7:45am-8:15am for the first session, and 11:45am-12:15pm for the second session.